1. 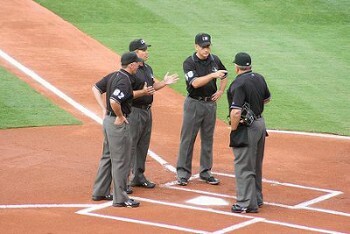 Both umpires should be at home plate 15 minutes prior to the start of the game. 2. The umpires are in charge of the game, and therefore may rule on weather conditions once they step onto the field. 3. An umpire must be square to the base that he is making a call at. 4. A ball hit foul before 1st or 3rd base should not be ruled upon until it comes to rest, is touched by a player or coach or hits a man-made object in foul territory. 5. All umpires, prior to making a call, should be set and motionless. 6. The plate umpire uses his left hand to show strikes and the right to indicate balls when showing the count to the pitcher or base coaches. 7. When cleaning the plate the umpire should bend over the plate facing the pitcher. 8. All runners need not be on their base before the ball is put in play. 9. Among players, only the catcher may be in foul territory before the ball is put in play. 10. When putting the ball in play, the umpire shall call “Play”. 11. The ball must be alive and in play in order that an appeal be made. 12. A pitch which hits the dirt and bounces through the strike zone shall be called a ball. 13. Do not allow a player to wear a Medic Alert bracelet. 14. The batter must stand with both feet inside the batter’s box to receive a pitch. 15. The 1st baseman must have both feet in fair territory when holding on a runner. 16. A player becomes a legal substitute once he takes the field, steps into the batter’s box or becomes a runner. 17. At the Mosquito level, with 2 out and a runner on 1st base the batter is automatically out if she strikes out and the catcher drops the ball. 18. Except in a force play, when 2 runners occupy the same base, the first runner there retains the right to the base. 19. A base runner does not need to re-touch his base on a foul tip. 20. A defensive player entering the the game is allowed as many warm up throws as the umpire feels are necessary. 21. Umpire interference may only be caused by the plate umpire. a. make the fair-foul decision along either base line b. exit the plate area to the left c. move to a point half way to 1st base and d. stay on the foul line e. all of the above. 23. When a player bats out of turn it is she, not the proper batter, who is called out. 24. Both umpires have equal authority on the field to make calls and deal with situations. 25. A batter does not need to make an attempt to avoid a pitch that hits her;she is automatically awarded 1st base. 26. Not stepping directly to the base that the pitcher is throwing to is a balk. 27. Whether a ball is fair or foul is determined by the position of the ball relative to the foul line in question. 28. A runner who is contacted by a hit ball, before the ball reaches an infielder, is automatically out. 29. An umpire who sees that a runner has missed a base while running, or has left a base prior to a catch on a fly ball, shall call that runner out immediately. 30. You would be wise, when calling balls and strikes in a lower division game ie. Mosquito or Pee Wee to enlarge your strike zone accordingly. 1. With no runners on base, the pitcher must pitch from the Wind Up position. R1, R2. 0 out. Batter hits a fly ball to deep centre field. R2 leaves early and stops at third base. R1 tags up and advan-ces to second base. The ball is caught by the center fielder who throws it to second base. The second baseman tags the base and indicates to the umpire R2 left early. This is a legitimate appeal. 2. R2. 1 out. Batter hits a ball between the centre fielder and right fielder. Plate umpire is responsible for watching R2 touch third base. 3. With runners on base, the pitcher must use the Set/Stretch position to pitch. 4. With two strikes, the batter bunts the ball foul. As this is a foul ball, the batter is not out. 5. Any umpire may call “play” and put the ball into play. 6. The pitcher’s glove is black and grey. This is legal. 7. You arrive at the diamond and it begins to rain after you have already dressed. The diamond is clearly not fit to play on so, in order to save everyone the bother of a plate meeting, you go to both managers and inform them that the game is called. You are the plate umpire. 8. A runner trips rounding third base and his coach picks him up. This is legal.contact. 9. The ball is dead immediately when catcher’s interference is called. 11. A fair batted ball bounces off the third baseman and rolls out of play. The batter-runner should be awarded second base. 12. When the batter or runner hinders a defensive player who is making a play, you should call offensive intereference. 13. Runs never score when the third out is made on a force play. 14. The batter hits a ball high into the air. The ball lands in foul territory behind the plate and then rolls, untouched, in front of home plate where it comes to rest. This is a foul ball. 15. The batter swings at, and misses, an inside pitch which hits him. The ball is dead immediately and the batter awarded first base. 16. A pitched ball bounces and hits the batter. The ball is dead and the batter is awarded first base. 17. You have forgotten your umpire’s cap at home. You should apologise to your partner and both managers and not umpire the game. 18. An appeal on a missed base must not be allowed if “Time” has been called. 19. When an infielder has secured a ground ball and thrown it wide of first base the plate umpire must call “Time” and award the batter-runner 2 bases from the time of the pitch.